Umpqua Oats - Oatmeal reinvented! 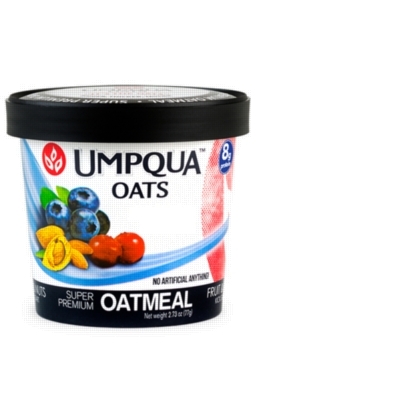 Umpqua Oats is an all-natural oatmeal featuring custom milled thick, chewy oats (also known as groats) mixed with premium fruit, nuts, and natural flavorings. Umpqua Oats are non-GMO, whole grain certified, kosher, and made in the U.S.A. with no gluten ingredients. Perfect for breakfast, lunchboxes, camping, or a healthy snack-on-the-go! Choose from delicious flavors like Salted Caramel Meltdown, Vanilla Almond Crunch, Kick Start, and Jackpot in a case of twelve 2.56 oz. cups.